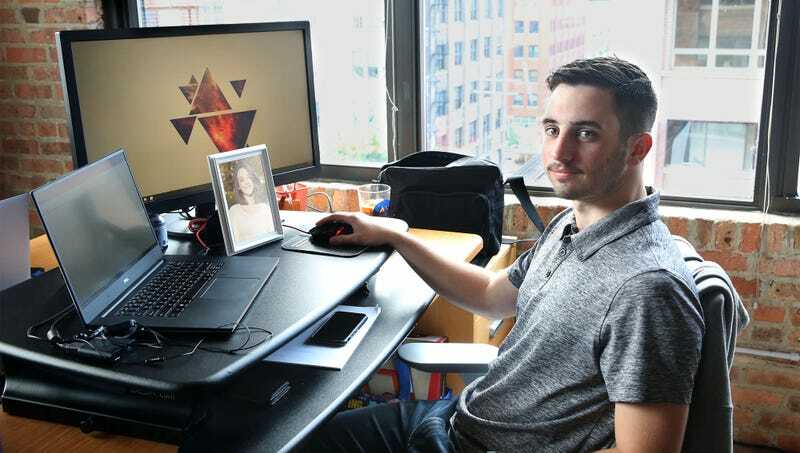 CLEVELAND, OH—Carefully evaluating the effect that displaying the photograph would have on the image of someone his age, 27-year-old systems analyst Martin Lambert disclosed Tuesday that he was unsure if he could pull off keeping a framed picture of his wife on his office desk. “On the one hand, it would absolutely be nice to have Jessica’s picture on my desk, no question about that, but on the other hand, it might look like I think I’m some wise old family man or something,” said Lambert, gazing thoughtfully at the 4-by-6-inch snapshot of his spouse on their recent vacation to Argentina and ruminating that while she is, after all, his wife, they’ve only been married a year, and the photo might clash mood-wise with the basketball hoop over his wastebasket and the commemorative beer bottle he employs as a bookend for his manuals. “This is a thing guys do, right? I mean, Jeff pulls it off, and he’s 32, but I don’t know, he’s also pretty religious, so that might be different.” Lambert later decided to compromise and displayed the photo by having it held by a posable action figure of his favorite wrestler.